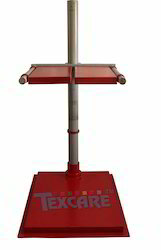 Prominent & Leading Manufacturer from Delhi, we offer drop tester. The drop tester is used for determination of effect of dropping on transport packages. This test helps to determine the ability of the packages and packing material placed inside them for cushioning to provide protection to its contents and to measure the ability of the container to withstand rough handling. In this test the package to be tested is placed on a frame having two swivel doors. The height of the frame is adjusted to the desired value. The doors are opened suddenly, the package is dropped on to a steel platform, and the extent of damage caused evaluated. Part 4 : Vertical Impact Drop Test. Drop Tester is a reliable instrument that can be used for analyzing the ability of the packaging containers to withstand the drops faced by them during transit and shipping (As per IS:7028 Pt IV). Provision with angular drop arrangement to ascertain the transport worthiness of the package from all angles. Suitable for Boxes, Pet, Containers, etc.